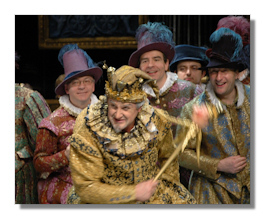 Rapturous applause greeted this production of Rigoletto, which by now is getting rather long in the tooth. (It was first premiered in March 1997.) Judging by the applause when the curtain rose for Act III much of the appreciation was for the set, which the opera-going audience of Warsaw must have seen many times. Personally I could do without the heavy scenery and lavish interiors, particularly since the scene change between the two scenes in Act 1 required a 15-minute interval that broke the flow of the first act. Musically, however, there were definitely things to admire. Carlo Montanaro, the music director at the Warsaw Opera, made clear from the opening bars that he would be emphasizing the dark side of the opera. In this he was fully supported by the Mexican baritone Jorge Lagunes in the title role. Lagunes gave by quite some way the most memorable performance of the evening, with a compelling portrayal of the bitter, besotted, and vindictive hunchback, culminating in the roar of self-hatred that ends the opera. Unfortunately Lagunes was not well matched by the Kosovan tenor Rae Lahaj as the Duke of Mantua. Lahaj, who has been singing this role and Alfredo Germont to some acclaim in Germany, has a nice voice and certainly looks the part of the Mediterranean Lothario, but he falls somewhat sort when it comes to expressiveness. Soprano Małgorzata Olejniczak-Worobiej replaced the scheduled Aleksandra Kurzak at short notice. Looking at her history on Operabase this is one of her first principal roles at a major house (although she did sing Gilda in Warsaw in June 2013). After what appeared to be some initial difficulties getting in sync with the orchestra and other participants she gave a fine performance. Her voice is delicate, with a commendable purity of tone, best suited to the more contemplative moments of the role (as opposed to the final quartet, for example). The cast was rounded out to good effect by Piotr Nowacki as the assassin Sparafucile. Nowacki was suitably menacing and also strong enough to carry the lead soprano round in a sack. Anna Bernacka was convincing as Sparafucile's sister Maddalena. Likewise Magdalena Idzik as Giovanna. The orchestra and choir of the Teatr Wielki acquitted themselves very honorably.